How do you envision urban wilderness? For me, this question brings to mind so many ideas and visions, of what’s wild and alive in the city today, of what was once wild and living in the city hundreds of years ago before the intensive “settling” by Europeans. What is Urban Wilderness and how do you envision it? 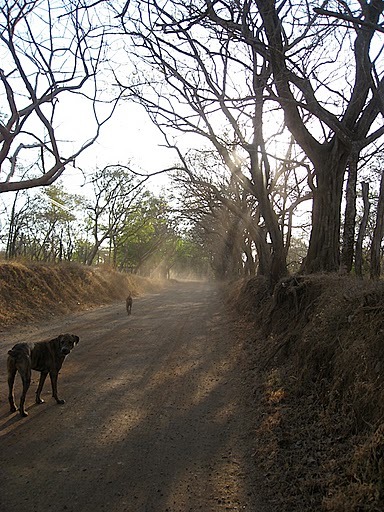 : Wilderness is all around us though we’ve paved over much of it. It fights the asphalt, struggling to succeed. Finds its way through crack and crevice, planting itself in abandoned buildings, untended sidewalks and parking lots. Nature thrives in the edge. In the gravel live tiny microbes, under sidewalks in compacted street tree beds, mycorrhizae are at work on the roots of isolated trees. Most immediately, there are fragmented patches of remnants of wilderness in the parks in which we find refuge from the urban hardscape. On a rare occasion, alone in Prospect Park on a trail in ‘the woods,’ I am no longer in the city, or not the city of 2010. Wilderness is where we feel an unnameable pull, a call to our heritage, to the billion-year evolution of our inner flora. Where we feel more human and more part of the planet from which we’ve sprung. It can happen while crossing the street, maybe catching the flight of a bird or its song. Or we can try to make it happen, seeking a piece of earth to claim for an afternoon of reflection. What type of interventions would love to see to help shape Urban Wilderness? We’re interested in both the practical and the fantastically impractical. : Reclaim riparian buffer zones. Take over the paved over. Dig up the pavement and concrete and build urbanite moss gardens in shady alleys and backyards. Plant trees, shrubs, wetland grasses where the pavement was. Reconnect the urban forest. Have a ’stream’ of trees continuing from Wave Hill down to Central Park, down Park Avenue. A line of trees connecting all of the city’s parks, relinking the mycelial network that allows them to thrive. Migrating birds will find more sanctuary. Maybe we’ll begin to get a sense of the thickness of birds described by early settlers. The air will be a bit cleaner. A newfound sense of calm will fall upon even the most trafficked city neighborhoods. How would you practically teach and perform such an intervention? (and Would you be interested in leading it? ): To start: Hold public demonstrations of what was once present, before it was paved over, using data from the Mannahatta Project. Create giant posters covering the fronts of buildings with recreations of forest stands. Hang flocks of birds from wires between buildings. Secondarily, convince city planning and officials that street trees should have continuous tree beds extending the length of city blocks. Dig away the sidewalk between trees and plant low-maintenance grasses and plants. Optimistically, obtain parcels of land and get to replanting forests and riparian buffer zones. I know there would be many willing participants to dig in. There’s just the small matter of procuring the land. Maybe we could start with the 12,000 acres of vacant land in the city first. I would love to lead this kind of intervention. This post was submitted by Liz N.
An industrialized world such as the one we live in has its advantages. Cool computer technology that allows us to communicate instantly with people around the globe; high-speed transport that has the ability to take us to a foreign land within hours, not days; medical advances that give sick or injured people better chances of surviving or thriving. But it seems in our fast progression to this industrialized society, some important aspects of life were left behind. We’ve lost the skills that allow us to be self-reliant and at the same time we’ve lost our ability to depend on our neighbors. We’ve lost our sense of community. Yet there’s a growing movement to re-establsh what we’ve lost while regaining a newfound abundance in the world around us. 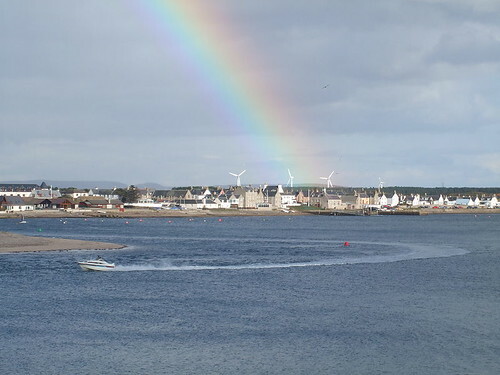 Entire towns are being transformed and villages established that meet the permaculture principles of “care for people, care for the earth, and share the abundance.” One such village, considered an “eco-village” since the 1980s, is Findhorn, Scotland. The Turning Point: A Return to Community features Findhorn, its community, and the community’s dwindling dependence on fossil fuels. I was lucky to be part of one of its first North American screenings. The home above was made from recycled whisky barrels. 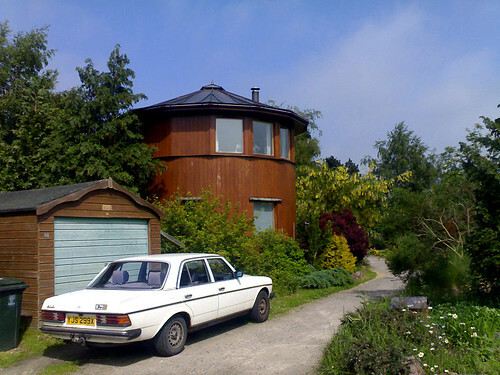 Like the Transition Town movement started in Ireland and the UK, Findhorn ecovillage demonstrates what life can be like in a post-peak-oil world. It isn’t a return to a rag-and-bone agrarian existence. It isn’t all doom and gloom. As long as we start the changes now, we can thrive in a world with little reliance on fossil fuels. The Turning Point film is a peek into a future we can all look forward to. If you’d like to see The Turning Point: A Return to Community, visit the film’s website. 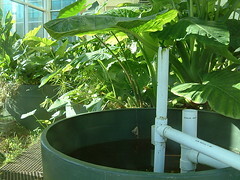 This post can also be seen on Greenopolis. Aluminum seems like a fairly innocuous and ubiquitous material. It has many applications: foil for wrapping food, take-out containers, soda cans, electronics components, appliances, cooking wares, car parts. It’s all around us. But how many of us stop to think about where metals like this are coming from? The great thing about aluminum is that it is considerably easy to recycle, it uses less energy and is extremely less polluting than creating virgin aluminum. Plus recycling it is cheaper than extracting bauxite ore (the base for aluminum). So why are we still creating virgin aluminum? And at what cost? Virgin materials for making metals like aluminum are often found right in the middle of someone’s homeland, their source of health, wealth, and livelihood. The extraction of these materials requires the removal of people from their land. 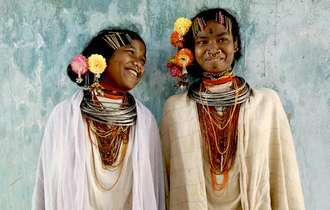 The Dongria Kondh people of Niyamgiri mountain in India know what will come of them if a British mining company gets their way. Vedanta Resources wants to mine bauxite ore for making aluminum from their sacred land. But the Dongria Kondh will not have any of this. They’ve seen the destruction that has ensued on neighboring villages from Vedanta’s refinery. The naturally abundant water that comes from mountain streams is used not so much for drinking, but to keep the refinery processes running. 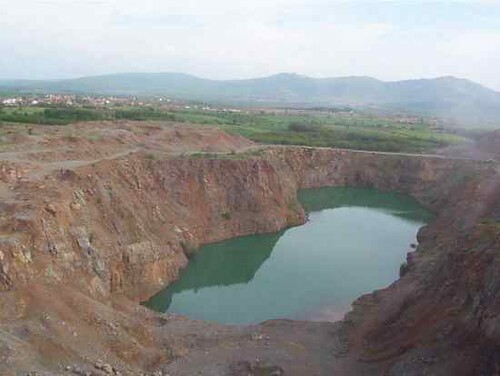 Giant toxic slurry pits are a blunt forboding of what could come of Niyamgiri mountain. This short film gives us a small hint of what would be lost if the mine operation goes forward. After watching the film visit Survival International’s website. They’re the only international organization supporting tribal peoples worldwide. There are a few small actions you can take to prevent the destruction of people, cultures, and land. Buy less: Simply keeping the things you have longer rather than buying new will help keep virgin resources from being extracted. Buy used: Used cars, used appliances, used cooking ware – you get the idea. 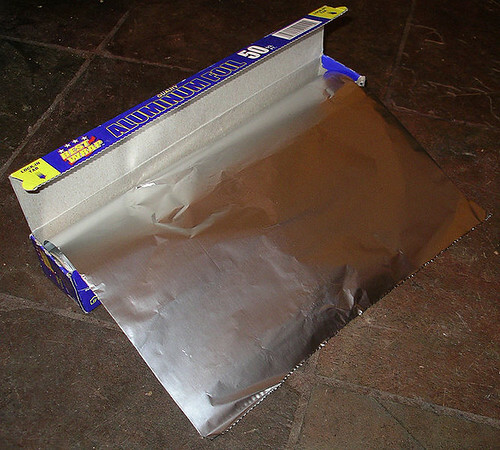 Buy recycled: Support brands like If You Care, who make 100% recycled aluminum foil. Close the loop, recycle: One of the reasons why the US is not a global leader in aluminum recycling is because its citizens are not recycling. Be sure to sort out your aluminum goods from your other trash, regardless of whether you’re at home, at work, at a picnic, on vacation, or on the road. Post inspired by this one at Elephant Journal. When my friend Andee asked me if I’d donate my services for the upcoming Citizen Schools NY Spring Gala, I couldn’t pass up the opportunity. Citizen Schools is a unique take on the after-school program. Just as the name implies, citizens (adult volunteers) provide hands-on learning projects for under-served students in grades 6 to 8. Through apprenticeships and presentations, these students gain valuable experience that’s not included in their regular school curricula. Some of the apprenticeships Citizen Schools have hosted include public speaking, starting a restaurant, journalism, video game design, and activism through art. On March 10th, the New York branch of Citizen Schools is holding their Spring Gala at NBC’s Studio 8H – where SNL is performed and filmed. My healthy home consulting services will be up for bid, so come out to support a good cause and maybe ‘win’ a session with me! Get your tickets here. 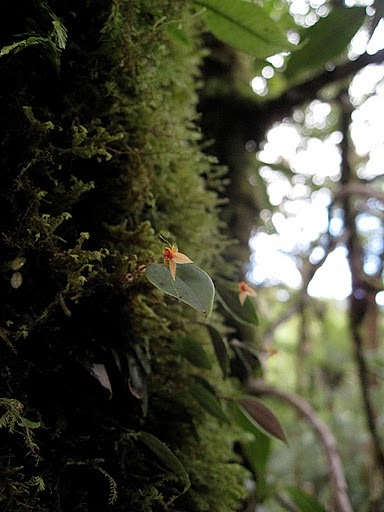 In equatorial regions, there is greater diversity of plant species than areas north and south of the equator (where there tends to be more within-species diversity). 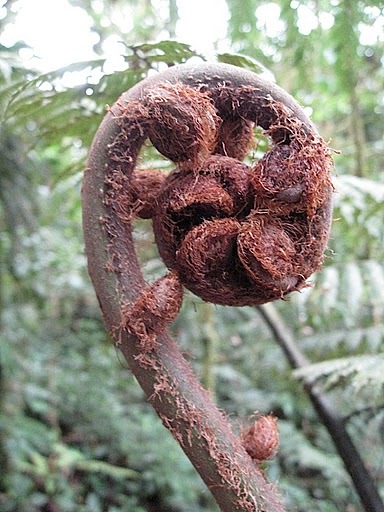 Walking through the rainforest and cloud forest, this was pretty evident. 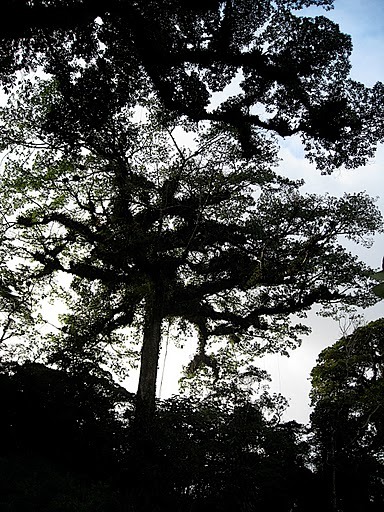 Bromeliads, orchids, and other epiphytes grow high up in the canopy, their roots dangling down like Tarzan swings. 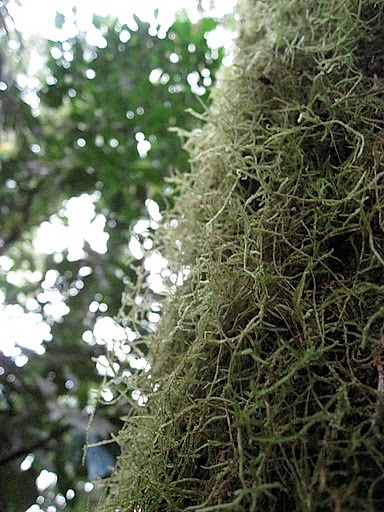 All sorts of moss, ferns, and fungus grow on the sides of trees and in any nook they can occupy. 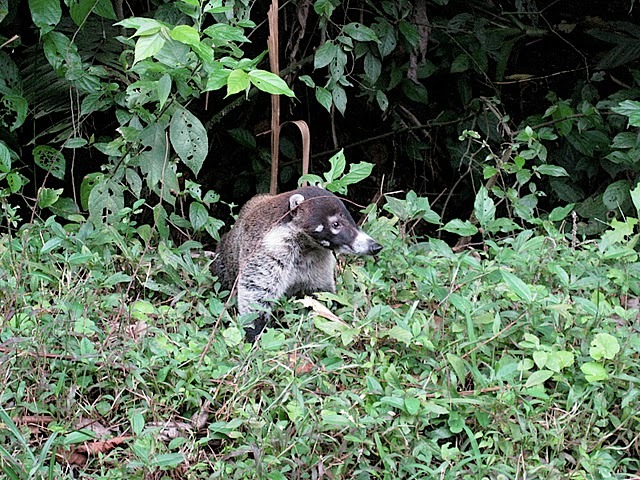 There are hundreds of bird species, snakes, spiders, and interesting fauna, like the agouti (a large rodent), coati (or pizote, a raccoon relative), and endangered tapir. The landscapes are diverse, too. Dry forests, rain forests, cloud forests, volcanoes, flatlands, hillsides, and beaches (Pacific and Caribbean) are all part of a country roughly the size of West Virginia. Sure, the rolling hillsides with pastured cattle look idyllic, but much of that pasture was once forest. The good news is the government rewards cattle ranchers for leaving portions of their land forest, protecting habitat vital to diverse animal species and tree cover that maintains a healthy rain cycle. 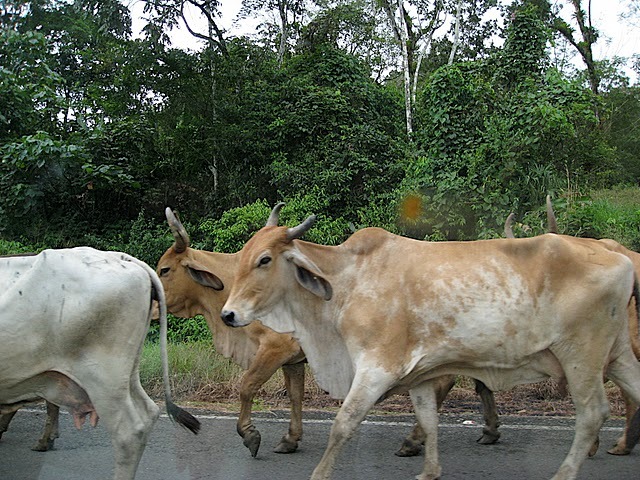 To preserve the health of waterways, there must also be a 50 meter buffer zone between pasture and rivers and streams. 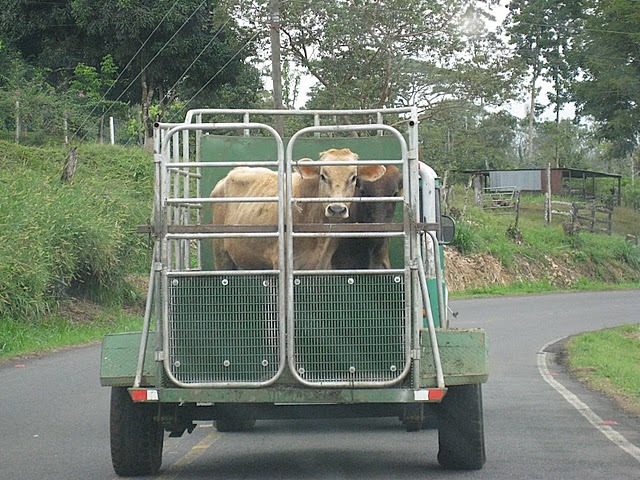 In response to the deforestation brought on by logging and cattle ranching, both private and government-funded preservation efforts are taking place in Costa Rica. 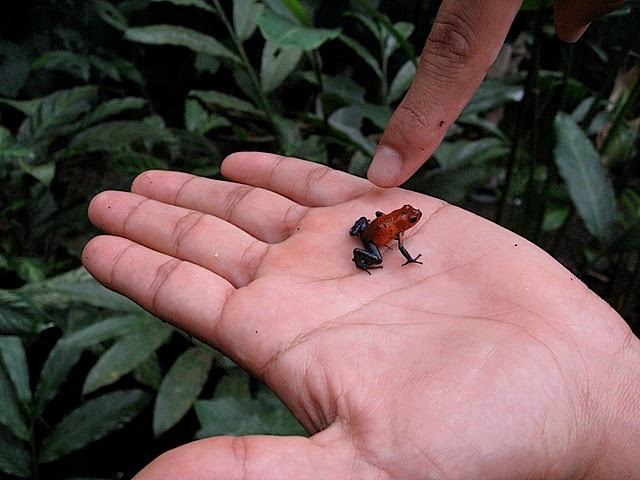 At the diminutive Ecocentro Danaus, a secondary forest where there was once deforested and denuded land, a great amount of diversity has found its way back. We saw a mama sloth and her baby (which I was very excited about! 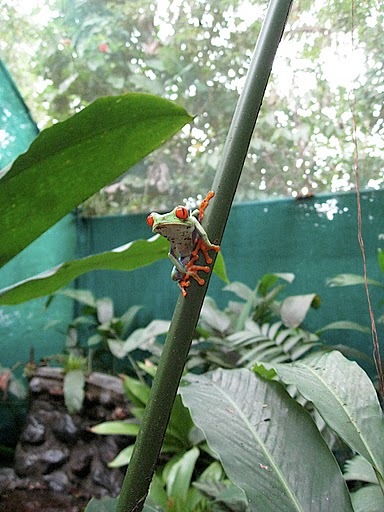 ), tree frogs, butterflies, a Jesus Christ lizard, toucanettes, and lots of other birds. For a place that’s only about 600 square meters, it was an impressive demonstration of how restoring native forests can have such a positive impact on protecting wildlife. Danaus also offers a place for the indigenous Maleku people to display and sell their gorgeous colorfully painted and carved artwork. As part of a volcano tour (which we never ended up seeing – it was shrouded in clouds), we took a guided hike through the Arenal Rainforest Reserve. It was easy to see where James Cameron found his inspiration for Avatar. 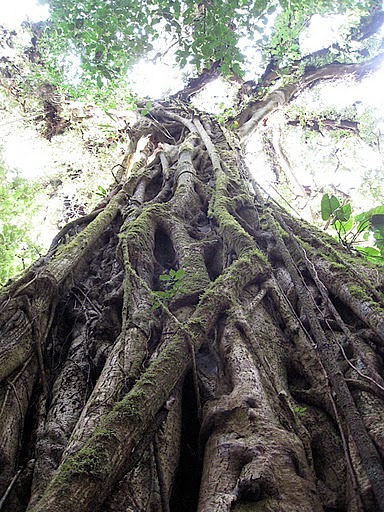 Giant trees covered in epiphytes had great significance to the N’avi in the film, and to the Mayans thousands of years before Avatar was conceived. 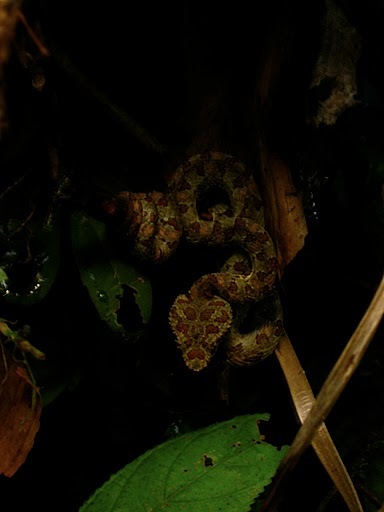 Aside from the towering trees, we saw a deadly eyelash viper, curled up on a branch. 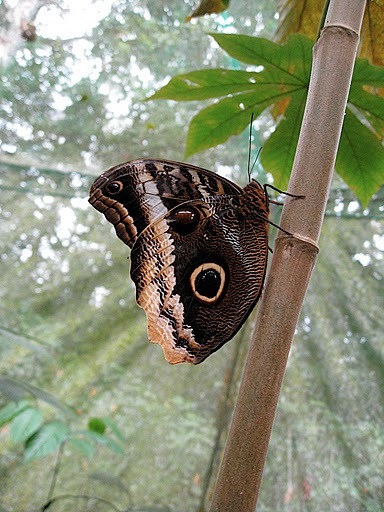 At the Monteverde Cloud Forest Reserve, a privately funded conservation park run by Centro Cientifico Tropical, visitors can take guided tours of the dense secondary and primary forest to discover all sorts of creatures and verdantery (okay, I think I just made up that word). Our guide, Danilo, enthusiastically walked (and sometimes jogged in order to catch a glimpse of a transitory creature) us through the well manicured trails of the otherwise wild forest. 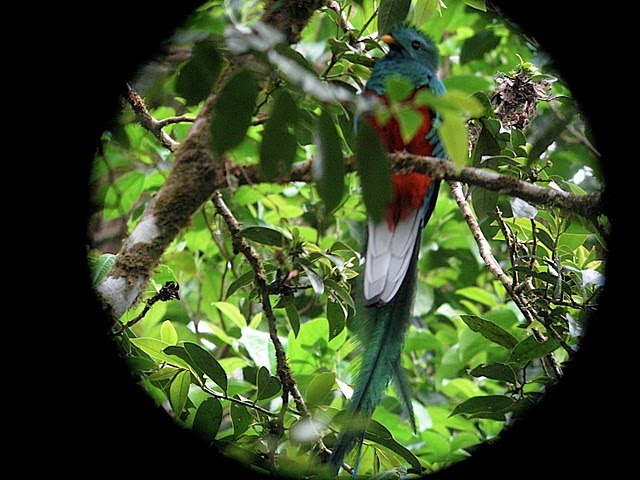 Many nature enthusiasts come just to witness the quetzal, a bird species that is said to be in decline. Many leave without seeing one. We were lucky enough to see not just one but at least 4 quetzals. The male is especially resplendent (as they are called) for the gorgeous iridescent plume feathers that hang down from its back. Mayan kings would pluck these special feathers and add them to their headdresses – the shifting colors and soft fir-like nature of them surely made the kings appear otherworldly. 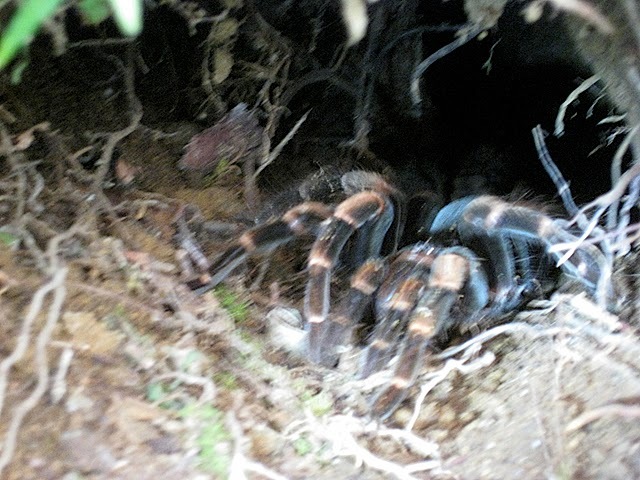 As a bonus at the end of our tour, Danilo teased a female tarantula out of her nest for us to see. 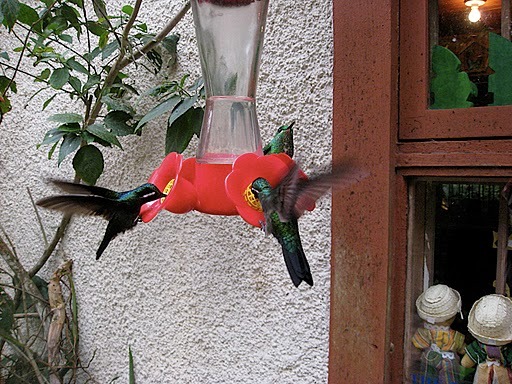 Then we visited the hummingbird gallery to engulf ourselves in the buzzing and humming of the quick and tiny birds. The Monteverde Cloud Forest Reserve was at one time part of a Quaker settlement (and is in part still managed by Quakers). 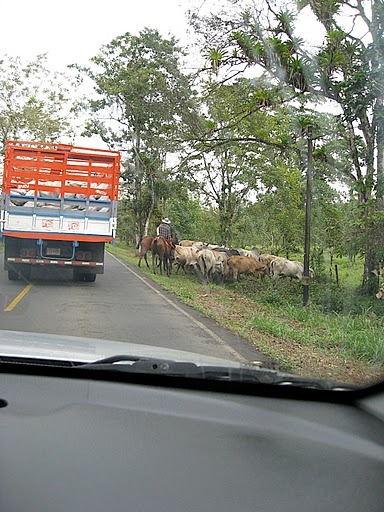 Knowing their water supply for ranching would be severely compromised if the mountaintop forest were no longer there, the Quakers worked with Centro Cientifico Tropical to ensure protection of the cloud forest. The national water utility and the tourism board got together and created the Bandera Azul Ecologica (ecological blue flag) to reward beach communities for their ecological responsibility. A 90% score or better in water and environmental quality gets the beach a blue flag. Find out which beaches earned blue flags here. 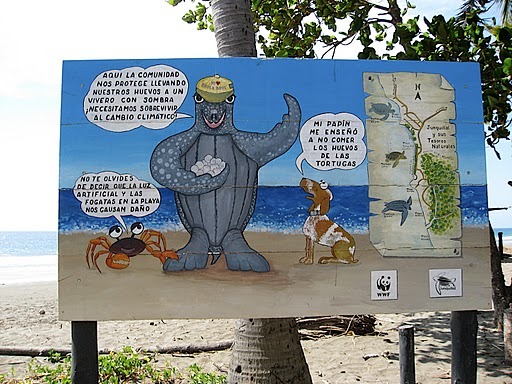 Turtle eggs are protected from poaching and predators at Playa Junquillal, a blue flag beach. 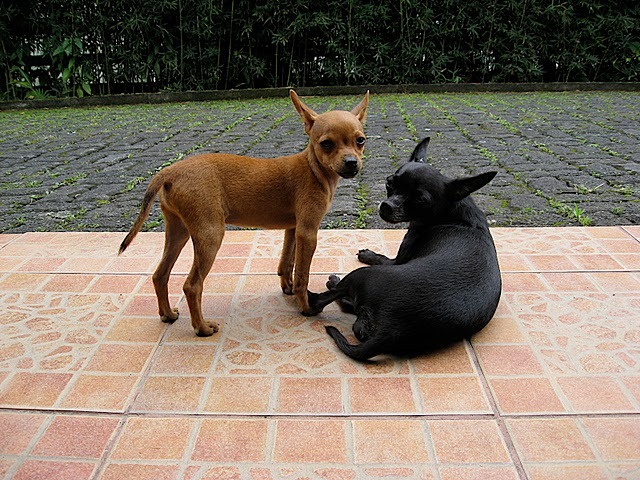 Without rabies to worry about, dogs roam the streets freely. They seem more cat-like than dogs in the US. Independent, finicky, sometimes aloof, apprehensive of other dogs, yet loyal to humans. 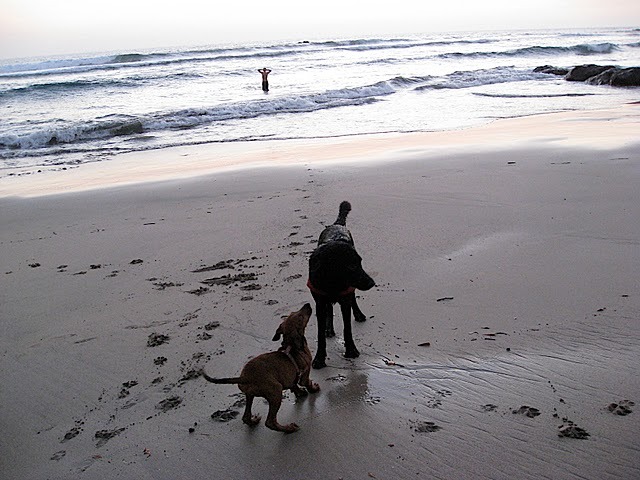 We had the companionship of 4 such dogs at the house where we stayed in Playa Negra. They were serious about protecting their property from other animals and strangers, but they were really friendly to us. It was comforting having them there, even when their middle-of-the-night howling at who-knows-what took me out of my dreams. 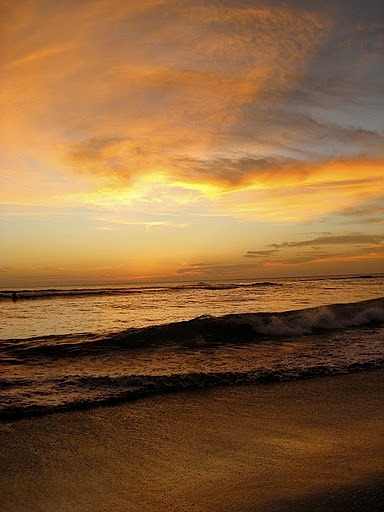 Without the distractions of TV and internet, it was easy to get into a more natural rhythm of waking with the sunrise and winding it down a couple of hours after the sun set. The government protects 40% of the land from development and the majority of Costa Rica’s power comes from renewable sources of energy (mostly hydroelectric). There are some really good recycling efforts in place in some locations, with even organics (compostables) collection. But for such an eco-friendly country, there’s still room for improvement. Just like here, there is disposable everything and individually wrapped goodies in the pulperias and supermercados. 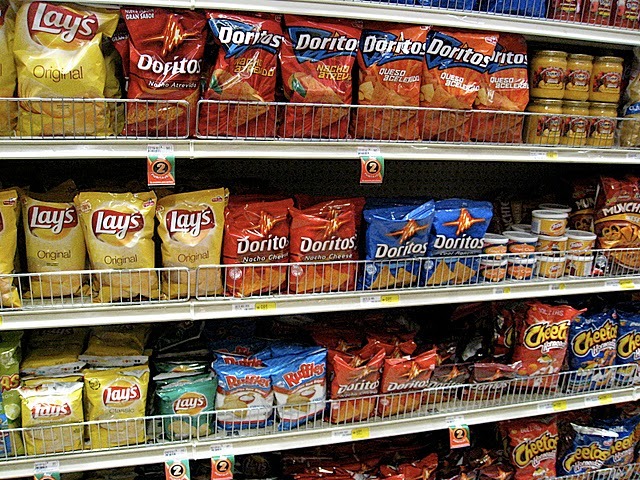 It felt just like home with all of the industrialized food options at the grocery store. And then there are the nasty chemical cleaning products proliferating the shelves and being used in businesses and households pretty ubiquitously (at least from what I saw in my 8 day stay). And don’t get me started on the cologne. Illegal logging is still an issue, as is poaching plants from protected parks. 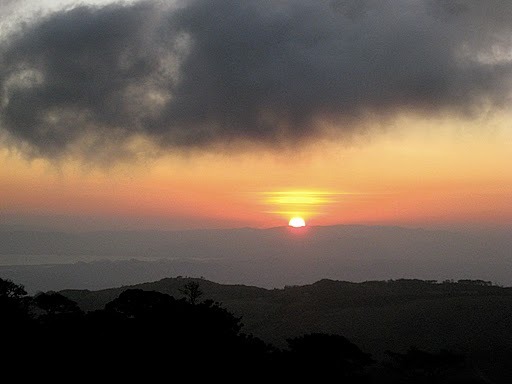 But despite these gripes, I am truly glad (and very lucky) to have experienced the pura vida way of Costa Rica. 1. 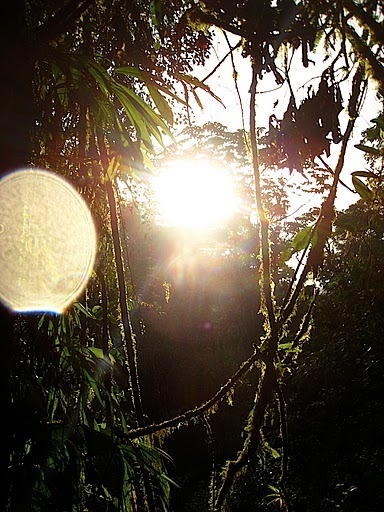 Don’t underestimate the power of the equatorial sun. It can really do some serious damage to your skin. Stay out of the sun during the midday hours, basically anytime from 10am to 4pm is probably a good call. Of course, wear plenty of sunscreen, at least 30 SPF. Use brands that are less toxic – my favorites are California Baby and Badger . 2. Check into an eco-lodge. ResponsibleTravel.com promotes lodging that’s not just ecologically sound but socially responsible, too. 3. 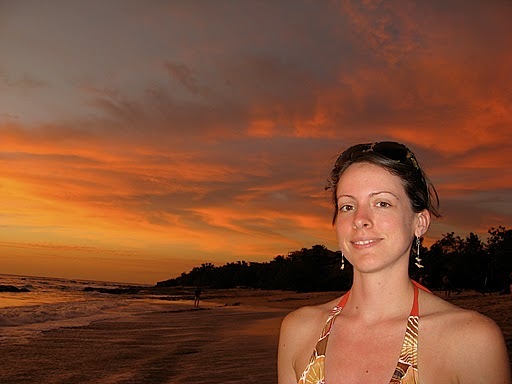 Just like at home, consider your own ecological impact while in Costa Rica. Here’s a simple rule: Take only photos and leave only footprints. 4. Skip the plastic. If you plan any trips to the supermarket or pulperia, BYOB – bring your own bags. It’s easy enough to tuck a couple of foldable shopping bags into your suitcase or backpack. Also, drinking water from the tap is safe and delicious, so no need to buy the bottled stuff. 5. Crafts made by locals and indigenous people make nice souvenirs. 6. US dollars (dolares) are accepted just about everywhere, so there’s usually no need to exchange money. 7. If you’re an apprehensive driver, leave the driving to a taxista or a tour company. The roads have greatly improved in the last few years, but there are still some seriously bumpy (and winding) back roads on the way to some of the more frequented destinations. If you do decide to drive, get a GPS and bring a map for back-up (sometimes the GPS prefers the most direct route, not the most sane route). You are currently browsing the Raganella blog archives for February, 2010.